Domesticated dogs and cats get the same diseases that we humans do…but not when they are fed their natural diet. 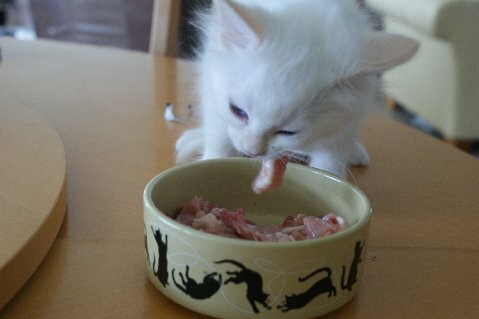 The dry food and canned food that contains meat “by-products” and cereals are unhealthy for you pet. You can save money and vet bills..and your animals health by making their food and feeding them a raw foods diet. it takes me about an hour to make my cats food for the month. I freeze it in portions and take out enough for the next day and place it in the fridge to defrost. 5000 mg fish oil (a good source of essential fatty acids Do NOT use cod liver oil! 3/4 tsp Morton Lite salt with iodine when using chicken. Liver – If using chicken legs, thighs or a whole chicken carcass minus the organs, add 4 ounces of chicken livers per 3 lb. of meat/bones/skin. Vitamin E – I prefer using the d-tocopherol (natural) versus dl-tocopherol (synthetic) vitamin E.
I find dry vitamin E capsules easier to work with. Bone meal powder – for use if you are not going to use a grinder to grind the bones with the meat. Please note that different brands of bone meal powder vary in their composition. This is one option; I save eggshells, let them dry completely and grind them very fine in the food processor. Use this recipe to get your pet used to a raw food diet. After a few months, when their jaws are stronger, you can give who pieces with the bone in, UNCOOKED! Cooked bones will splinter and are dangerous for your animal. You will see that your pet will eat every single morsel of the meat and connective tissues and alsop get the marrow out of the bones…just like they would be doing in nature. I cut the raw chicken after I have frozen it for about an hour, it makes it easier to slice. I dice it in about a ½ to 1 inch dice. I place the hearts, gizzards and livers in the food processor and grind them to mix in to the diced meat. Mix all ingredients well. I use empty coconut milk yogurt containers to freeze the right amount for each day, then I pop them out and put them in large Zip-loc bags and back in the freezer. understanding something fully, but this article offers good understanding even.